Overlooking Downtown Huntsville, Monte Sano is one of the premier destinations for outdoor activities in the Southeast. Anchoring the district is Monte Sano State Park which offers panoramic views of Downtown Huntsville. Enjoy the over 14 miles of hiking and mountain biking trails and an 18-hole disc golf course. If it’s a rustic chic weekend stay you’re after, visit the Monte Sano State Park Cabins or Campgrounds. An open-air museum and park and a destination for all ages! Some of Alabama's best views are found at Baron Bluff, making Burritt perfect for special events, field trips, and enjoying nature! For those wanting to live near the great outdoors, Monte Sano offers everything from city-view retreats to eclectic cottages on the mountain. Plus, the eclectic Little Green Store serves as a centerpiece for arts, wine, and other collectibles. Circle the perimeter of a large, former limestone quarry now used as a unique venue for public events including a summer concert series and Moon Over Three Caves Dance each fall. A great family hike! The trail winds alongside Fagan Creek and in the spring offers a beautiful display of native wildflowers. Follow the path of one of the country's oldest, and shortest-lived, rail corridors—Monte Sano Railway. As you hike the narrow dirt and stone bed, you will pass waterfalls and the original stone bridge supports. While a challenging hike, this trail passes a small quarry and the remnants of Monte Sano Hotel (accessed using Hotel Basin Trail). Built in the late 1800's, this resort promised fresh water springs, cool climates, and valley views. Located at Land Trust's Hiker's Parking Lot off of Bankhead Parkway, this trailhead offers a pavilion perfect for picnics. This spot also serves as a great starting point for hikes as it sits at the intersection of several trails. 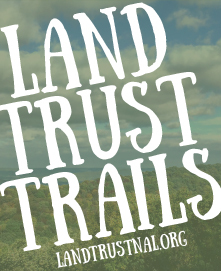 Find a trail map to plan your hike at landtrustnal.org/trailmaps.